It's still entwined in mystery and jungle vines, but one of Cambodia's grandest monuments is slowly awakening after eight centuries of isolated slumber, having attracted a crack archaeological team and a trickle of tourists. "It takes awhile to unfold this temple — and everywhere there are enticements," says John Sanday, the team leader, as he navigates through tangled undergrowth, past dramatic towers and bas-reliefs and into dark chambers of the haunting monastic complex of Banteay Chhmar. At its height in the 12th century, the empire extended over much of Southeast Asia, its rulers engaging in a building frenzy which produced some of the world's greatest religious monuments. Called the "second Angkor Wat," Banteay Chhmar approaches it in size, is more frozen in time than the manicured and made-over superstar, and has so far been spared the blights of mass tourism of recent years at Angkor. 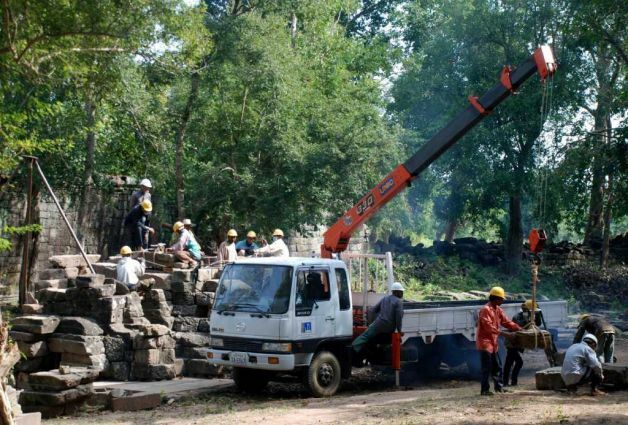 In 2011, an average of 7,000 tourists a day visited Angkor, one of Asia's top tourist draws located near the booming northwestern city of Siem Reap. Banteay Chhmar saw an average of two a day, with no tour buses and bullhorn-wielding guides to disturb the temple's tranquility or traditional life in the surrounding village. 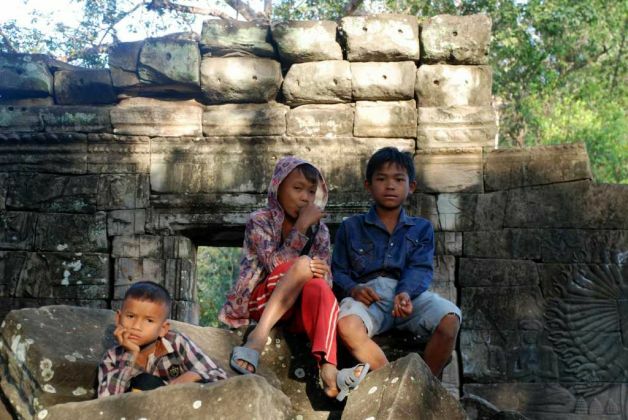 Abandoned for centuries, then cut off from the world by the murderous Khmer Rouge and a civil war, Banteay Chhmar didn't welcome visitors until 2007, when the last mines were cleared and the looting that plagued the defenseless temple in the 1990s was largely halted. A year later, the California-based Global Heritage Fund began work at the site under the overall control of the country's Ministry of Culture and now spends about $200,000 a year on the project. 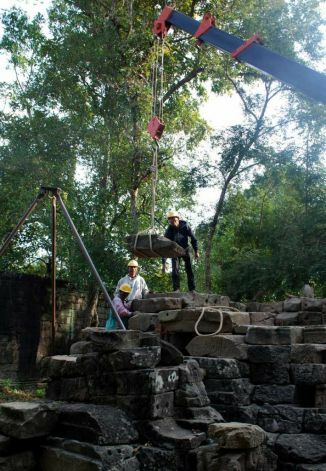 Sanday, a veteran British conservation architect, assembled a team of 60 experts and workers, some of whom were with him on an earlier restoration of the Preah Khan temple at Angkor. Others were recruited from the surrounding community and although barely literate, Sanday says they're among the best he's worked with in Asia. Challenging them are hundreds of thousands of stone blocks from collapsed shrines and galleries scattered helter-skelter within the 4.6-square-mile (12-square-kilometer) archaeological site. Towers teeter, massive tree roots burrow into walls, vegetation chokes a wide moat girding the temple. 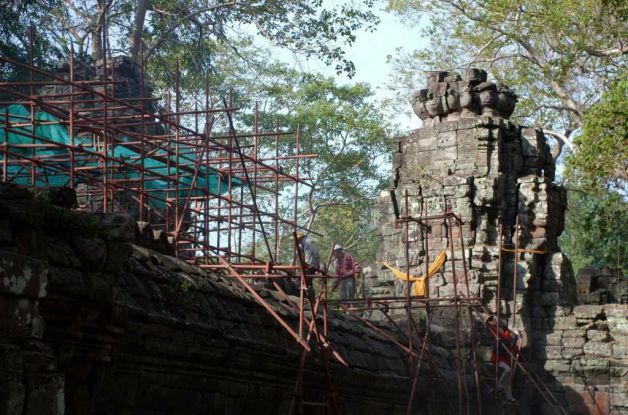 Three-quarters of the bas reliefs — rarely found at other Angkorian temples — have fallen or been looted, the most notable being eight panels depicting Avalokiteshvara, an enlightened being embodying Buddhist compassion. Thieves sheared off four panels with jackhammers, smuggling them into nearby Thailand where two are widely believed to be decorating the garden of a Thai politician. A pair has been recovered and the others are still at the temple, although only two still stand. "We've been struggling away with this gallery for nearly two years now," says Sanday at another bas-relief, one depicting a figure believed to be Jayavarman VII leading his troops into battle. In vivid detail, the ancient sandstone wall springs to life with charging war elephants, soldiers plunging spears into their enemies and crocodiles gobbling up the dead.